Perfect Paraffin or Soy Wax Candles. Perfect dyes for candles. Add a little, add a lot - We designed these color bars for easy use. They are made like Hershey Bars so you can easily break off the pieces and combine to create your own unique colored candle wax. Perfect dyes for candles. 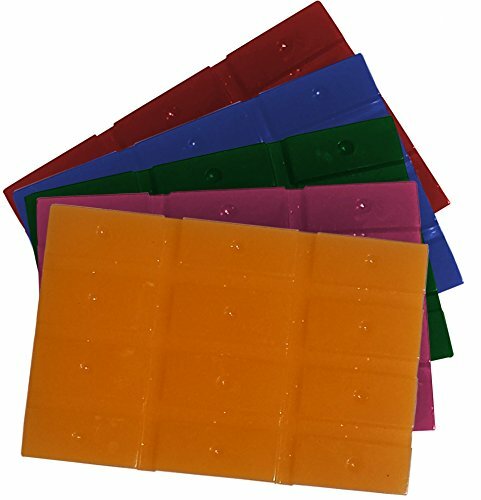 These candle wax dye packs are available in 5 vibrant color wax bars: blue, green, red, red-violet and yellow that can each color between 4-6 lbs of wax depending on the color-intensity you want your wax color to be. Add a little, add a lot - We designed these color bars for easy use. They are made like Hershey Bars so you can easily break off the pieces and combine to create your own unique colored candle wax.